I was recently offered the chance to review a new personalised book The Incredible Intergalactic Journey Home and jumped at the time as knew that the big one would love it! Made from the team at Lost My Name it sounded an exciting and fun story, perfect for bedtime. I kept it quiet from Ella and Mr Jones managed to intercept the postman and stash it away. We’ve missed out on storytime lately so whipping this book out at bedtime went down a storm. “That’s my name! That’s me!” she shrieked as we started reading. There are tonnes of personalised books out there now, but these books are really nicely written with lots of fun rhyme which makes it perfect for all ages, and the personalisation goes further than just the name. In this book, a spaceship getting lost finding its way back to earth. Finally, the spaceship finds its way and magically appears above where we live. “There’s my school field” she says as she spots our house and her school. What I love about this book is that it’s not limited to Christmas and so would make a lovely story year round. It was a huge hit with Ella and she insisted on taking it to school the next day to show her teacher. This book and the original Lost My Name book is available from £19.99 direct from Lost My Name. However, the lovely people at Lost My Name have offered the opportunity for one person to win their own personalised copy of The Incredible Intergalactic Journey Home. To enter: please see below. Good luck! Disclaimer: this is a collaborative post but all opinions are my own. I love personalized books for kids. Not only is it a great way to encourage them to read, but it’s a great keep sake. I recently got one back from my mom who had been keeping it for me and it brought back so many memories! Thanks for posting this on the marvelous Mondays link party for me to find! This is something I really want to do for my two kids, I’ll be checking them out! 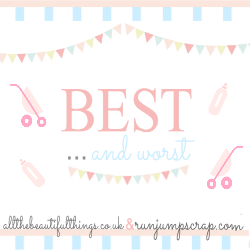 Popping back from #bestandworst thanks for linking up!